05/10/17 Honda (american honda motor co.) is recalling certain 2003 honda accord coupe vehicles, equipped with a four-cylinder engine. if the passenger frontal air bag module has been replaced, such as after a crash necessitating frontal air bag deployment, the replacement air bag module may include a takata air bag inflator. these inflators may rupture due to propellant degradation occurring after long-term exposure to lower absolute humidity, temperature and temperature cycling. Honda will notify owners, and dealers will inspect the vehicle and replace any takata inflator used in the passenger frontal air bag module, free of charge. the recall is expected to begin may 1, 2017. owners may contact honda customer service at 1-888-234-2138. honda's number for this recall is kf0. 05/02/16 Honda (american honda motor co.) is recalling certain model year 2004-2007 accord vehicles manufactured october 1, 2003, to august 17, 2007. the affected vehicles may have been assembled with an incorrect passenger frontal air bag module that does not comply with the advanced air bag requirements. as such, these vehicles fail to comply with the requirements of federal motor vehicle safety standard (fmvss) number 208, "occupant crash protection." 11/06/15 Honda (american honda motor co.) is recalling certain model year 2014-2015 honda accord hybrid vehicles manufactured august 29, 2013, to may 30, 2015. electrical interference may cause the hybrid system to switch into fail-safe mode, disabling the gasoline engine, limiting the vehicle's speed to 40 miles per hour and functioning only on battery power. once the battery is discharged, the vehicle will stall. Honda will notify owners, and dealers will update the hybrid system software, free of charge. the recall began on november 6, 2015. owners may contact honda customer service at 1-888-234-2138. honda's number for this recall is jt7. 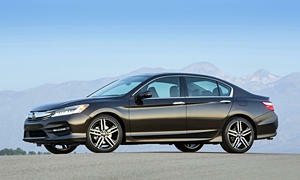 06/15/12 Honda is recalling certain model year 2007 and 2008 acura tl and model year 2003-2007 accord v6 vehicles. in may 2012, honda filed a defect report to recall certain model year 2007 and 2008 acura tl vehicles. in september 2012, honda informed the agency that it was including an additional 573,147 vehicles including certain model year 2003 through 2007 accord v6 vehicles. the total number of vehicles being recalled is now 625,762. prolonged under-hood and power steering fluid temperatures may cause the power steering hose to deteriorate prematurely, resulting in cracks and power steering fluid leakage. 04/13/05 On certain passenger vehicles, a loose terminal in the main fuse box may cause the fuel pump to lose power. if the fuel pump becomes inoperative, the engine may not start. Dealers will replace the entire fuse box free of charge. the recall began on april 13, 2005. owners may contact honda at 800-999-1009 or acura at 1-800-382-2238. Honda recall nos. p73, p74.customers may also contact the national highway traffic safety administration's vehicle safety hotline at 1-888-327-4236 (tty 1-800-424-9153), or go to http://www.safercar.gov. 08/13/13 Engine American honda motor co., inc. (honda) is recalling certain model year 2013 accord vehicles that are low-emission vehicle (lev) ii rated that were manufactured january 15, 2013, through april 5, 2013. the fuel tank neck may be out of specification causing the fuel pump to not properly seal to the fuel tank. 10/07/10 Engine Honda is recalling certain model year 2003 honda accord, civic two and four door, and model year 2003-2004 honda element vehicles. the interlock lever of the ignition switch may unexpectedly deform, which can allow the interlock function of a vehicle with an automatic transmission to be defeated. 04/02/07 Engine On certain vehicles, a coil wire inside the fuel pump relay may break, causing the fuel pump to lose power. if the fuel pump becomes inoperative, the engine may not start. 03/07/05 Engine On certain passenger vehicles, the interlock operation of the ignition switch may not function properly, making it possible to turn the ignition key to the "off" position and remove the key without shifting the transmission to park. 08/30/02 Engine On certain minivans, sedans, coupes, and sport utility vehicles equipped with v6 engines, a timing belt tensioner pulley on the water pump is misaligned and could cause the timing belt to contact a bolt on the cylinder head. eventually the belt could be damaged and fail. Dealers will inspect the water pump and if it is one of the defective pumps, the water pump and timing belt will be replaced. owner notification began august 30, 2002. owners who take their vehicles to an authorized dealer on an agreed upon service date and do not receive the free remedy within a reasonable time should contact honda at 1-800-999-1009 or acura at 1-800-382-2238. 04/27/04 Transmission and Drivetrain On some mini vans, sport utility and passenger vehicles, certain operating conditions can result in heat build-up between the countershaft and secondary shaft second gears in the automatic transmission, eventually leading to gear tooth chipping or gear breakage. 12/23/10 Suspension and Steering Honda is recalling certain model year 2010-2011 honda accord v6 and model year 2011 honda pilot vehicles. the bolts that attach the lower left and right front damper bracket to the front suspension and the spindle nuts on the pilot may not have been properly tightened which may result in loss of steering. the spindle nuts for the axle on the accord v6 may not have been tightened properly which may result in excessive noise and/or loss of steering. Dealer will inspect and replace any loose front damper bracket bolts or spindle nuts on the pilot if necessary. dealer will inspect and replace the spindle nuts on the accord v6 if necessary. the safety recall began december 23, 2010. owners may contact honda at 1-800-999-1009. Honda's safety recall no. r60.owners may also contact the national highway traffic safety administration's vehicle safety hotline at 1-888-327-4236 (tty 1-800-424-9153), or go to http://www.safercar.gov . 07/07/00 Suspension and Steering Vehicle description: passenger vehicles. the rear suspension lower arms and/or control arms could break due to improper welding. Dealers will inspect and replace the rear suspension lower arms or control arms if necessary. Owner notification began july 7, 2000.owners who take their vehicles to an authorized dealer on an agreed upon service date and do not receive the free remedy within a reasonable time should contact honda at 1-800-999-1009. also contact the national highway traffic safety administration's auto safety hotline at 1-888-dash-2-dot (1-888-327-4236). 11/08/17 Electrical and Air Conditioning Honda (american honda motor co.) is recalling certain 2013-2016 honda accord vehicles. the case for the battery sensor, part of the battery management system, may allow water to get in, potentially causing an electrical short. 11/15/16 Electrical and Air Conditioning American honda motor company, inc. (honda) is recalling certain model year 2008-2010 accord vehicles. in the affected vehicles, the air bag control units may corrode and fail. Honda will notify owners, and dealers will replace the air bag control units, free of charge. parts are expected to be available in fall 2016. interim notifications have been mailed to owners on march 15, 2016, and a second notice will be mailed when remedy parts are available. owners may contact honda customer service at 1-888-234-2138. honda's number for this recall is jw9. note: this recall supersedes recall 15v665. 07/17/08 Electrical and Air Conditioning Honda is recalling 351,000 my 2003 accord vehicles. if water enters the windshield wiper motor breather port, which is designed to allow the motor to vent warm air during normal operation, it can result in corrosion inside the motor housing. this can cause a failure of the electrical circuit breaker inside the motor housing. Dealers will inspect the windshield wiper motor for signs of corrosion. if no signs of corrosion are present, a cover will be installed over the wiper motor to prevent water from entering the wiper motor housing. if signs of corrosion damage are observed on the wiper motor, the motor will be replaced. the recall began on july 17, 2008. owners may contact honda at 1-800-999-1009. Honda recall no. q78.customers may contact the national highway traffic safety administration's vehicle safety hotline at 1-888-327-4236 (tty: 1-800-424-9153); or go to http://www.safercar.gov. 02/08/07 Electrical and Air Conditioning On certain vehicles, the seat position sensor (sps) detects the driver's seating position and adjusts the air bag inflation pressure accordingly. the wiring harness for the sps was attached to the seat frame in the wrong location and may have been over tightened. the sensor wire may break and cause the air bag warning light to be illuminated, and the sps to fail. A failure of the sps causes the air bag system to default to full inflation pressure, regardless of the seat position. full deployment of the driver's air bag can increase the risk of injury for smaller drivers in a frontal crash. Dealers will replace the seat position sensor wiring subharness. the recall will begin on or about february 8, 2007. owners may contact honda at 1-800-999-1009. Honda recall no. q31.customers may also contact the national highway traffic safety administration's vehicle safety hotline at 1-888-327-4236 (tty 1-800-424-9153), or go to http://www.safercar.gov. 11/07/05 Electrical and Air Conditioning On certain passenger vehicles, on the frontal airbag system where the two external impact sensors is mounted, near the front headlights the front impact sensor bolts were not properly torqued. Honda recall no. p99 and acura q00 .customers may also contact the national highway traffic safety administration's vehicle safety hotline at 1-888-327-4236 (tty 1-800-424-9153), or go to http://www.safercar.gov. 11/30/04 Electrical and Air Conditioning On certain sedans, a tear in the fabric of the driver's front air bag occurred after apparent contact with the inside surface of the air bag cover during deployment. A torn air bag may not offer the same level of protection, in the event of a crash, thereby increasing the risk of injury to the driver. Dealers will install a protective fabric flap between the air bag module cover and the inner module. the recall began on november 30, 2004. owners should contact honda at 1-800-999-1009. Honda recall no. p54. customers can also contact the national highway traffic safety administration's auto safety hotline at 1-888-dash-2-dot (1-888-327-4236). 06/16/04 Electrical and Air Conditioning On certain passenger vehicles, the dimmer control for the instrument panel lights could fail due to heat buildup. If this occurs, the instrument lights may fail and, at night, the driver may not be able to see the instrument panel gauges, such as the speedometer. Dealers will replace a multiplex control unit for the instrument panel lights. owner notification began june 16, 2004. owners should contact honda at 1-800-999-1009. Honda recall no. p36.customers can also contact the national highway traffic safety administration?s auto safety hotline at 1-888-dash-2-dot (1-888-327-4236). 12/02/05 Other On certain passenger vehicles, the tires could have been damaged when the tires were mounted on the wheels. in certain circumstances, the bead area of the tire may have been damaged. Honda recall no. q04.customers may also contact the national highway traffic safety administration's vehicle safety hotline at 1-888-327-4236 (tty 1-800-424-9153), or go to http://www.safercar.gov. 03/05/02 Other Certain sedans and coupes fail to comply with the requirements of federal motor vehicle safety standard no. 209, "seat belt assemblies." certain rear seat belt buckles were improperly manufactured. In a previous recall (01v-380), only right and left buckles were inspected. the rear center buckle should also be inspected and corrected if necessary. this recall is being conducted only for the center buckle. dealers will inspect the vehicles and replace the seat belt assemblies that were imrpoperly manufactured. only buckles that are marked (on the back side of the buckle) with an assembly number beginning with 00185, 00186, or 00187, will be replaced. owners should contact their dealer for this replacement. owner notification began march 5, 2002. owners who take their vehicles to an authorized dealer on an agreed upon service date and do not receive the free remedy within a reasonable time should contact honda at 1-800-999-1009. 01/22/02 Other Vehicle description: certain sedans and coupes fail to comply with the requirements of federal motor vehicle safety standard no. 209, "seat belt assemblies." certain rear seat belt buckles were improperly manufactured. Dealers will inspect the vehicles and replace the seat belt assemblies that were improperly manufactured. only buckles that are marked (on the back side of the buckle) with an assembly number beginning with 00185, 00186, or 00187, will be replaced. owners should contact their dealer for this replacement. owner notification began january 22, 2002. owners who take their vehicles to an authorized dealer on an agreed upon service date and do not receive the free remedy within a reasonable time should contact honda at 1-800-999-1009.